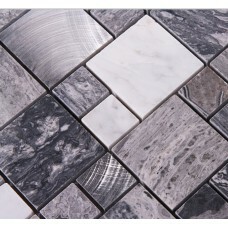 Stone tiles are excellent choices for interior and exterior applications on floors and walls. They come in an array of colors and in many patterns in a honed or cleft finish. A honed finish means a matte finish and a cleft finish is when the surface is rough due to the method of splitting the material during quarrying. 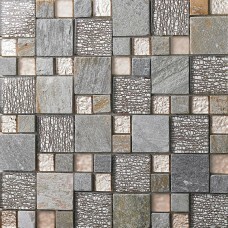 The true beauty of stone tiles is impossible to fake. The ageless character of real stone brings an unmistakably natural element to your design, whether you’re creating a showstopping backsplash for your kitchen, or recreating a grotto retreat in your pool or shower. Every tile is unique, as it’s been cut from actual rock. 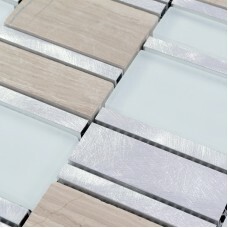 The naturally occurring veining, flecks of color and unusual marbling add interest, texture and depth to your tile work. Our collection of real stone tiles contains a huge variety of shapes, sizes, and shades, from glorious mosaics to humble pebbles. 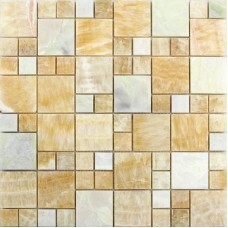 Stone tiles offer a lovely natural look because they are cut and hand processed from actual stone. 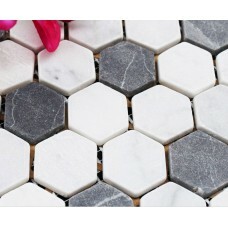 The tiles are sorted according to similar size and color and then are individually glued to a mesh backing. Occasional imperfections, veins and lines of separation can often be found within the stones and only add to their natural outstanding beauty. Material:stone, glass and metal, Color Finish:cream white, silver and yellow, Sheet size:300mmx300mm, Chip Size:8/20/40x73mm, is_customized:Yes, This mosaic tile is mesh mounted..
Thickness:8mm, Sheet Size:300 x 300mm, Collection:stone mosaic tiles, Tile Type:mosaic, Chip Size:23 x 23mm, 48 x 48mm, is_customized:Yes, This mosaic tile is mesh mounted on high..
Thickness:7mm, Sheet Size:300 x 300mm, Collection:stone mosaic tiles, Tile Type:mosaic, Chip size:30mmx30mm, is_customized:Yes, This mosaic tile is mesh mounted on high quality..